"At Home in Hyderabad": First India Road Trip Part 1 - "The Jain Temple"
With Amy Suzanne out of town for almost three-weeks (she returned to the States on the night of the Ganesha Immersion - - first to Orlando, Florida for some Deloitte training - - then up to Maryland for this year's Capitol Challenge Horse Show - that's where she is right now!) - our driver, Krishna, Beloved the Lhasa Apso and I - decided to "head out on the highway" for a little Road Trip. My friend Vivek, the owner of Beyond Coffee, had informed me that he had grown up in the town/city of Warangal, about 160 kilometers north of Hyderabad...and that it might just be a great place to see some Hindu temples and some nice churches. Vivek was right! It was a wonderful place and I thoroughly enjoyed it! We look off from home last Tuesday morning...we had planned to leave at around 6:30 A.M. - - but that time became 7:00 A.M. because....well - - that's just the way things go in India! The initials are "I.S.T." - which officially stand for "India Standard Time" - - but, as one learns here pretty quickly, it really stands for "Indian Stretchable Time"!! We tried to beat the traffic through Secunderabad...but - no such luck. Once we got to the highway it was not much faster because there are buses and trucks and auto-rickshaws out there as well...and much of the drive was to be on two-lane-two-way roads....and - let's just say that the rules for safe passing here are not quite what they are at home in the U.S. (Hoooo boy, is that ever an understatement!!) With The Bee in tow, one must be keenly aware of her need to use the "Ladies Room" - - she's really pretty good about letting you know her desires. We stopped the first time on a side-road that lead to an engineering college, sort of out in the middle of nowhere. There were a couple of pretty rocky hills that looked like they could have been in California or Arizona...palm trees growing nearby, with reddish sandstone outcroppings. Krisha walked Bee a bit while I took a couple of snapshots. Our first real stop was at a Jain Temple (see my photo above) in a town called "Aler" (I'm still not sure exactly what makes a "village" big enough to be called a "town" - - but whatever. This temple was literally on the other-side-of-the (train) tracks. By the way...safety barriers for roads crossing railroad tracks in India...come down a full five-minutes before the train actually arrives...people on foot just walk around...bicyclists and motorcycle riders drag their vehicles under the arm!! I must admit to knowing very little about the workings of the religion of Jainism. What I do know is at-best an Internet-assembled working knowledge of what they are all about and basically what it is that they believe...I had no idea whatsoever what this looked like "up close and personal!! The opening chapter of William Dalrymple's "Nine Lives" follows a Jain Nun (a very strange tale...if you have not read the book, you must get it immediately!) I must also say that my visit inside the temple was one of the strangest experiences of my life...and - as you know - - I'm a fairly religious fellow, not given to speak poorly about another man's religious practices....but this was just plain strange!!. 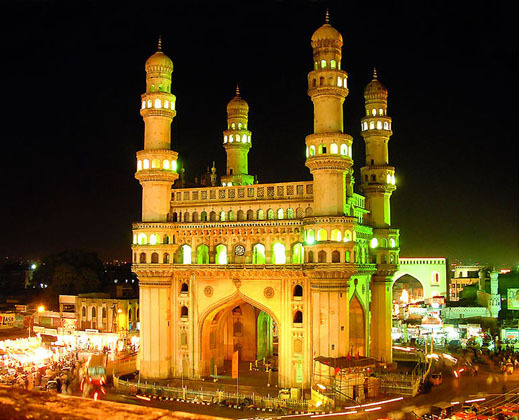 Andhra Pradesh is not really known for having been a stronghold of the Jain religion. Hence it comes as a total surprise to learn that one of the oldest spots upon which a Jain temple has been present for over two thousand years is this temple known as Kolanupaka, which is near this town of Aler, which is about half-way on the way to Warrangal city. This is about 100 kms from the capital city of Hyderabad and is only now emerging from obscurity. Generous contributions to rebuild the temple as well as a steady stream of pilgrims from other parts of the country no doubt aid the process. Heck, even I had heard of it! Nevertheless it remains a strange, incongruous place, a Jain temple in the middle of a predominantly Vaishnava (Hindu people who predominately worship Lord Vishnu in his various forms) countryside. The Jains, because of their belief that all life is sacred, wear these little mouth-and-nose covering "masks" while they do their worship. This is so they don't accidentally inhale a small bug while they are praying. Or, is it even prayer?? Do your own research on the Jains and you will see what I mean. Much like in Buddhism, there is no God. There are certain Jains (the monks and nuns) who take their vow of renunciation so seriously that they wear nothing at all. There were none of these Jain "religious" in the temple that day, or it would have definitely ranked as the strangest experience of my life, not just in the "top ten". Jainism traces its roots to a succession of 24 Jinas ("those who overcome", or conqueror) in ancient East India. The first Jina is traditionally believed to have been a giant who lived 8.4 million years ago. The most recent and last Jina was Vardhamana (a.k.a. Mahavira, "The Great Hero") He was born circa 550 BC) and was the founder of the Jain community. He attained enlightenment after 13 years of deprivation. In 467 BC, he committed the act of salekhana which is fasting to death. Each Jina has "conquered love and hate, pleasure and pain, attachment and aversion, and has thereby freed `his' soul from the karmas obscuring knowledge, perception, truth, and ability..."
In this temple, there are these little alcoves, each one containing an idol of one of the Jinas, or Tirthankaras, as they are sometimes called. I must tell you that, in contrast to Hindu worship, where there is a distinct difference between the depictions of the deity being worhipped (whether it be Krishna or Durga or Shiva or Ganesha)...no matter if the depiction be in icon-form or statue - you learn quickly to tell the difference. In the case of these twenty-four Jinas, they looked identical to each other...I could see no discernable difference at all between them. The Jain worshippers walked around and around the outside "aisle" of the temple, stopping for at least ten minutes at each idol...and placing little dots of sandalwood paste (?) or something on about 15 different spots on the idol's head and torso. I watched this for quite some time, not meaning to stare...but heck...Amy and I get stared-at here in India all of the time...so "turnabout's fair play"! Now here is where I get confused. This scene (and the preparation of prasadam and the bhajan singing that was going on in the center of the temple "sanctuary") was certainly reminiscent of Hindu worship...but as I said...there is no "God" in Jainism!! The people inside certainly looked as if they were worshipping the Jinas... It was a very strange scene indeed!! The Jain understanding of an uncreated and eternal universe leaves little room for an Almighty Creator God. Jains do, however, believe in a "perfect universal presence," as well as multiple deities who dwell in the heavens. In the Jain cosmology (from what I can understand) the realm of the gods consists of higher and lower gods. The lower act very human, and often rule as despots. Humans may call on these deities for assistance. One of the most important deities is Ambika, the Mother Goddess of Jainism. She is the patron deity of material prosperity, childbirth and protection of women. The practicing Jain believes that, being eternal themselves, humans can also attain "perfect beingness," or divinity. The most notable feature of Jain ethics is its insistence on noninjury to all forms of life. Jain philosophy finds that every kind of thing has a soul; therefore strict observance of this precept of nonviolence (ahimsa) requires extreme caution in all activity. As I mentioned above, Jain monks frequently wear cloths over their mouths to avoid unwittingly killing anything by breathing it in, and Jain floors are kept meticulously clean to avert the danger of stepping on a living being. The inside of the temple was pretty clean by Hindu standards (more on this when I write about the Kali Temple in Warangal in an upcoming blog!! )Jains regard the intentional taking of life, or even violent thoughts, however, as much more serious. Jain philosophy posits a gradation of beings, from those with five senses down to those with only one sense. Ordinary "householders" (folks like you and me) cannot help harming some created beings (how many mosquitoes have I smashed into goo since I've been in India??) - although Jain philosophy states that they should strive to limit themselves in this regard by refraining from eating meat, certain fruits, or honey or from drinking wine. In addition Jain householders are expected to practice other virtues, similar to those in Hinduism. The vows taken by the Jain monks are more severe. They eventually involve elements of Asceticism: fasting, peripatetic begging, learning to endure bodily discomfort, and various internal austerities constituting a Jain variety of Yoga. As I read about (in some amazement) in Dalrymple's Nine Lives book, Jainism is unique in allowing the very spiritually advanced practicioners to hasten their own death by certain practices (principally fasting) and under specified circumstances!! I took only a few photos inside the temple grounds (including the one at the beginning of this article), which turned-out to be a greater offense than trying to wear cargo-shorts inside!! I thought this one young security guard was going to take my camera away, but I slipped it into my pocket and said I wouldn't take any more!